If you keep up with the Skomer Island Blog, you'll have already been introduced to one of the Long Term Volunteers, Thom. I am the other LTV for the April-July period, I'm a 21 year-old Marine Biology graduate from the University of Liverpool and my name is Ruby Temple-Long. Having the amazing opportunity to gain experience working on the high profile nature reserve of Skomer Island coincides with my year out from study, before I head off to Scotland and the University of Edinburgh to complete an MSc in Marine Systems and Policies. 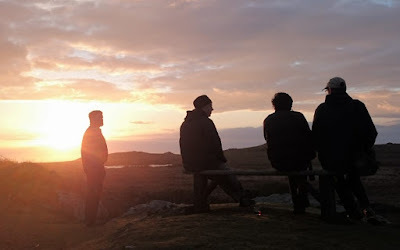 I have volunteered with a wide range of organisations before the Wildlife Trust of South and West Wales including; Greenpeace EU Unit, Wildlife Sense Kefalonia and Gloucestershire Wildlife Trust (Snows Farm Nature Reserve and Stroud Wildlife Surveys). The experiences mentioned above have all been extremely interesting but they aren't comparable to the unique four weeks I've already spent on Skomer. I was attracted to the island by so many things, but the parts that stood out the most were the vast array of species that can be found here and the numerous elements of practical research you can get involved with. Having a passion for marine species, my interest was sparked when I discovered the diverse range of seabirds and marine mammals that you may encounter on the island. I had been told that Atlantic puffins could be an almost everyday occurrence in the right season (and weather), and that nearly half the world’s population of Manx shearwaters come here to breed! I arrived with little knowledge of birds but would like to think that I am learning more about the species we see passing through each day, and by the end of my three months may even be a budding amateur ornithologist! 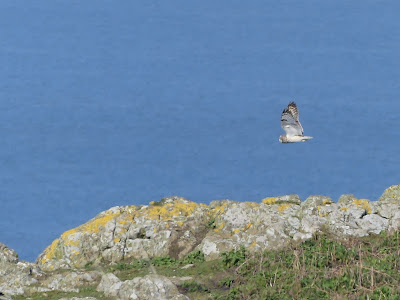 Already I have seen (or been shown) the common species on Skomer such as; Puffin, Chough, Kittiwake, Fulmar, Peregrine falcon, Short-eared owl and Swallow. In addition to the more unusual species such as Black redstart, Cuckoo, Snipe and Common sandpiper. The island is starting to get a little busier now with more researchers arriving and therefore more surveys to complete, but a few highlights from the past week were as follows. Each year the Trust undertakes a whole island Puffin count and on our first survey we found a record number of individuals, an astonishing 25,000! Thom and I were really pleased to be treated to a trip out to The Smalls with one of the trustees and on our voyage were greeted by a pod of Common dolphin that rode the bow of our rib for a while, with a small calf leading the way! Recently we were able to help some PhD students from Oxford University collect data for their study of Manx shearwaters which they return to Skomer each year to continue. The students are looking at the changes in the bird's body condition over the breeding season which includes monitoring a number of the same burrows each year and weighing certain individuals. They are particularly interested in those with geolocators as they are able to track their movements at sea and can learn more about how parents coordinate their foraging trips to feed the chicks. An impressive 62 species of crab have been recorded in waters surrounding the British Isles. To be called a crab, an animal has to have ten legs, two of which have evolved to form to powerful pincer-like claws (or chela) for feeding and fighting! and all but one species (Chinese mitten crab) are marine. Unlike us, crabs have an exoskeleton and therefore don't have bones, they grow by forming a soft shell beneath their current 'skeleton' which causes their hard shell to shed and when this happens they are much more vulnerable, so tend to stay under the cover of rocks and thick clumps of seaweed. I've come across the following species of crab on my rocky shore explorations; spider, broad-clawed porcelain, edible and shore. I've also seen a number of anemones, which most of you will already know because of Finding Nemo! Anemones are relatives of jellyfish and coral and stick themselves to rocks waiting for prey to pass through their tentacles armed with barbed stinging cells (nematocysts). There are over 1,000 species of varying colours and sizes inhabiting oceans across the globe at a range of depths. Although some species can grow up to 1.8 metres across, the smaller species such as Beadlet, Snakelocks and Strawberry have been found on North Haven. Some Twin fan worms were also observed in a rock pool as was a Shanny beneath a large boulder at the waters edge! All of which are being taken down in my notebook and will be added to bird log under the 'other' section at the end of my stay. Another animal that has been particularly abundant on my rocky shore visits is the Shore clingfish, which is the focal species for my personal project that I will undertake during my stay. The Marine Conservation Zone team from Natural Resources Wales suggested that I look at this fish as it is particularly abundant across the Pembrokeshire coast however, little is known about its seasonality and breeding cycle here. All of the team has been helpful, answering any questions that I have had about the important work they do collecting data in the surrounding waters of the Skomer Marine Conservation Zone (MCZ) and have given me some really useful guidance for my research project. The clingfish is cryptobenthic, meaning it hides in crevices on the seafloor (beneath and between rocks). It's easily identifiable by its duck-like mouth and two blue spots (which remind me of opals) on the top of its head, on the bottom side it has specially adapted pelvic fins that form a sucker which is incredibly strong and anchors the fish to the surface of the rocks it inhabits. I will be looking at where the fish can be found across the shore and what time of year they are observed as well as life history traits such as spawning and egg development which has not been looked at on the shores around Skomer before. It has taken no time at all to settle in on Skomer with such lovely staff and so many people to learn from, in addition to the masses of wildlife that we are lucky enough to see there is never a dull moment. I'm looking forward to getting stuck into my personal project and Razorbill productivity survey now that Julie the Seabird Field Worker has arrived and hopefully I'll be able to give you more of an update on everything soon! 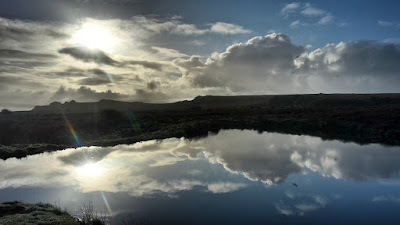 A guest blog this week from West Coast Birdwatching who ran our Spring Migration Special birdwatching weekend a short while ago. Another fantastic three days on the island! The first West Coast Birdwatching trip of 2017 saw Dave Astins & Toby Phelps take a group of 10 to Skomer Island, leading a ‘spring migration special’ on behalf of the Wildlife Trust of South & West Wales. 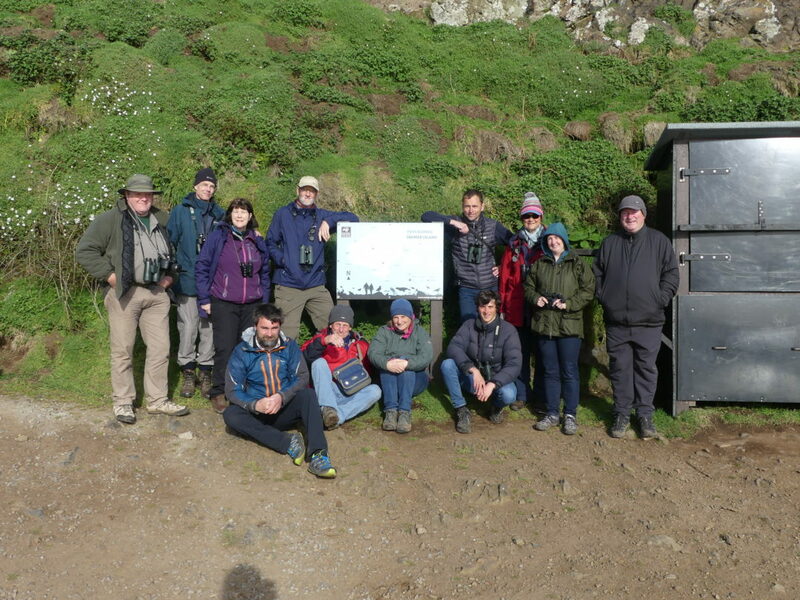 This was the 3rd spring in a row for this particular trip, and half of the participants had previously attended the autumn version – 2 in 2015 & 3 in 2016. Repeat participants are always a good sign! The 3-day trip started with the usual work of getting all our stuff from the mainland to Skomer, and all the way to our accommodation in the centre of the island at the farm. Thankfully the tractor was working! The 3 days that followed consisted mainly of sunshine (some rain to bring the migrants in might have helped), northerly winds (south-easterlies on the first day), plenty of tea & biscuits, lots of walking, chatting and learning how to identify all the birds we saw. Everyone saw some new species. We were lucky that the auks (Puffins, Guillemots & Razorbills) were on the island for the first 2 days, as by day 3 they had totally deserted! Migrant highlights included a male Ring Ouzel, a Black Redstart, up to 3 Merlin, Grasshopper Warber, Sedge Warbler, Blackcap Chiffchaffs & Willow Warblers. Hirundines were on the move, with Sand Martins outnumbering Swallows, and just a handful of House Martins. The numbers fluctuated from day to day, highlighting the difference the wind makes. We also saw very few Manx Shearwaters after dark, due to skies being so clear, presenting danger to them coming ashore in such moonlit conditions – Great Black-backed Gulls hunt well at night in these conditions! Skomer’s Short-eared Owls put on a show with up to 3 day-flying during our visit, and we finally caught up with a Little Owl on the 2nd day. Click on the link for the bird list from the trip. Click on the link for a photo gallery from the trip. My name is Thomas Faulkner, one of the new Long Term Volunteers that have the privilege of living on Skomer for the next 3 months. I am an Ecology graduate from Aberystwyth University and have a long history of volunteering in conservation. I have been heavily involved with the Montgomeryshire Wildlife Trust Dyfi Osprey Project and also the Vincent Wildlife Trust Pine Marten reintroduction project. This interest in wildlife and volunteering led to me become a weekly volunteer last September during Shearwater week where I had the amazing opportunity to help weigh chicks. 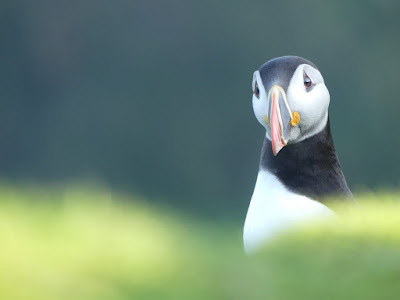 As soon as you spend any time on Skomer you quickly realise why it is the UK’s favourite nature reserve and after my weeks visit I knew I would be back! 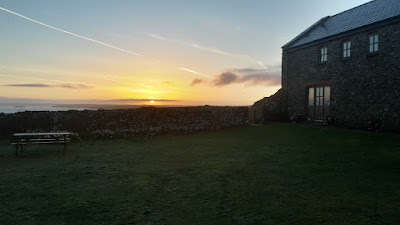 I arrived on Skomer on the 1st of April and will be helping out wherever needed but you may bump into me welcoming day visitors and conducting surveys around the island. I will also be helping with the general running and maintenance of Skomer. As part of my stay I will also be conducting a personal project. My project is going to focus on the vegetation of Skomer and trying to repeat a survey first carried out 38 years ago. I will be trying to find around 200 small yellow markers buried in bracken that indicate a vegetation plot. Not an easy job. I will also be monitoring nesting activity of the Greater Black Backed Gulls, the largest predator on the island, mapping territory and nests while noting numbers of birds and behaviours as well. Having just completed my first two weeks or so on Skomer Island, all I can say is it is living up to and exceeding all expectations. This week there have been so many species I have seen for the first time. On my second day the Puffins were starting to arrive in numbers and were showing courting and territorial behaviours in North Haven, while a pod of 30 Common Dolphin investigated the Dale Princess. And on the farm the Short eared Owl had an almost constant presence, searching for the endemic Skomer vole. Experiences like this are becoming an everyday occurrence. I am really looking forward to having new experiences like these in the three months I am here, and I really look forward to welcoming you onto the island. We’re now open! And as B said in our previous blog, time has certainly flown. Just a week ago we were a little worried about whether the island would be ready in time, and to be honest, I was still a little worried on Friday afternoon. Things fell into place though and with a last little bit of adjustment we were ready to welcome the first visitors of 2017! Thankfully the weather gods blessed us with a fantastic start to the season and we opened for day visitors and overnight guests on Saturday, as scheduled. There was quite a bit of luggage that came over on the first boat which included four weekly volunteers, two overnight guests and two new Long Term Volunteers, Thom and Ruby (introductory blogs to come). It certainly tested the early season fitness going up and down the steps multiple times. The first visitors of the year were treated to a fantastic day on Skomer. It was the first calm and sunny day in quite a while which meant the Short-eared Owls were making the most of the ideal hunting conditions, two of which were gliding over North Valley for most of the day, delighting visitors, staff and volunteers alike. A spectacle which we weren't quite expecting was also the sheer numbers of Puffins that came back to Skomer in the evening. We could see numbers building throughout the day and around 4pm we had over 2,000 in North Haven alone, but they kept building and by 7pm there were an amazing 7,300 Puffins in North Haven. We usually do our whole island Puffin counts in mid-April but if these numbers continue like this we may end up doing them early. To see a video of this, head to our Facebook page. Saturday was one of those idyllic days on Skomer where the weather was fantastic, the wildlife was on top form and visitors left with huge smiles on their faces. And Sunday hasn’t been bad either, with excellent weather, migrants passing though (Sand Martins, Swallows and Willow Warblers mainly) and a pod of 30 Common Dolphins spotted off North Haven. For us this is an incredibly early sighting and we wouldn’t be expecting to see dolphins off Skomer until the summer! That’s me done for now, but with the weather forecast to be similar for most of next week, we hope to see more friendly faces on Skomer soon and await more wildlife spectacles!